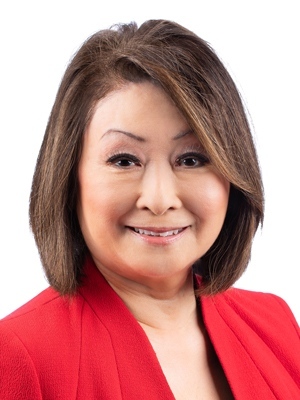 Mutsumi Takahashi is chief news anchor of CTV Montreal News. Takahashi's interest in broadcasting began at Concordia University where she worked at Radio Sir George (CRSG) and the student newspaper, The Georgian. She also hosted a series of interview programs for Concordia University TV (CUTV) in conjunction with CTV Montreal, then known as CFCF 12. She began her broadcast career as an intern at CKGM and then as a newsreader and interviewer at CJFM. Takahashi arrived at CFCF 12 in 1982 as a news reporter and she took her place at the anchor desk of CFCF News four years later. During that time, she was also a regular contributor on CFCF's community-based program, "Park Avenue Metro." Takahashi shared the 6 p.m. weeknight news anchor desk with RTNDA Lifetime Achievement recipient Bill Haugland, from 1986 until his retirement in November 2006, followed by Brian Britt and then Todd van der Heyden. Currently, she is the anchor of the 6 p.m. show and hosts the noontime newscast. Born in Shiroishi, Japan, Takahashi studied piano at the Toronto Conservatory of Music at the age of six. She is a graduate of Vanier College and Concordia University, holding both a B.A. and M.B.A. In the spring of 2013, she was awarded an honorary doctorate by her alma mater, Concordia University. She believes strongly in the importance of education, a legacy of her parents who were both academics. She was recently a co-chair of the Best Care for Life Campaign of the MUHC with Montreal Canadiens great Jean Beliveau. She also sat on McGill’s Beatty Memorial Fund Committee, which oversees the annual Beatty Memorial Lecture Series. In May 2017, she was honoured with a Lifetime Achievement Award by the RTDNA. This is the organization’s highest award, voted by a committee of her peers, which speaks volumes of the respect and reputation she has built in more than three decades at CFCF/CTV Montreal. She is currently the Honorary Chair of The Campaign for Concordia, Concordia University’s campaign to raise $250-million. The school is using its most ambitious plan ever to position Concordia as Canada’s next-generation university developing new institutes, research centres, think tanks, innovation hubs and academic programs. She is also the Honorary Patron, West Island Palliative Care Residence, a campaign that aims to raise funds to extend the benefits of best-in-class palliative care to as many Canadians as possible and to development a national education and knowledge transfer program. In June of 2017, she received a member statement in the Quebec National Assembly from Geoffrey Kelly, Liberal MNA, acknowledging her contributions made to journalism and the community. In June 2018, she was named to the Order of Canada.